An artist's illustration of DARPA's Orbital Express spacecraft in orbit, with the ASTRO servicing vehicle (left) bearing down on NextSat. SANFRANCISCO ? The technology and tools already exist to allow people and robotsto repair and refuel satellites in orbit. What is lacking is the recognition ofthat capability by senior government officials and a business model to enablecommercial companies to profit from the enterprise, according to government andindustry officials attending a workshop March 24-26 sponsored by the NASAGoddard Space Flight Center and held at the University of Maryland UniversityCollege in Adelphi, Md. "It'spretty clear," said Frank Cepollina, NASA deputyassociate director in the spaceservice capabilities office at NASA Goddard in Greenbelt, Md. "Thetime for study is over. We have now got to move forward." The workshopwas one step in a space agency campaign to demonstrate that a wide range ofsatellite repair, refueling and maintenance activities can be performed byhuman and robotic missions. NASA is conducting a study to determine thefeasibility and cost of in-orbitsatellite servicing. The results of that study are scheduled to bedelivered to Congress in September, said Cepollina, NASA'slead engineer for Hubble Space Telescope repair missions. NASA'slong-term goal is to prove that satellites can be serviced in orbit, conduct apathfinder mission to prove the concept and then transfer the technology to thecommercial sector, Cepollina said. NASA plansto demonstrate in-orbit satellite refueling at the international space stationwith the help of Dextre, the two-armed Canadian robot. In an experiment scheduledto be conducted in the next six to 12 months, Dextrewill be equipped with special tools on the end of its arms to cut through asatellite's exterior, insulation and wiring, hook up a hose and pump hydrazineinto the satellite. For the experiment, NASA will be relying on a simulatedsatellite, being built by NASA Goddard engineers and scheduled to be completedin October. The mock spacecraft ? essentially just the back end of a satellite? will be bolted to an Express Logistics Carrier, a platform attached to thespace station's exterior. Once the simulated spacecraft and tools arecompleted, the equipment will be sent to the space station. "Thesimulated spacecraft is fully wrapped, like a spacecraft in geosynchronous orlow Earth orbit," Cepollina said. The experimentwill be directed by astronauts on the ground, probably located at Johnson SpaceCenter in Houston, and will not involve any of the space station crew. "The fundamental objective is to prove that you don't have to design yoursatellites to be refueled on orbit," Cepollinasaid. "You can refuel existing fleets." Followingthis experiment, NASA plans to demonstrate the work can be done autonomously, Cepollina said. That demonstration will be important toshow that satellites traveling 14,000 kilometers from Earth in geosynchronousorbit also can be refueledand repaired. "We are trying to develop the dexterity of robots to fixspacecraft so they can continue to do their jobs, Cepollinasaid. "You would never buy a car that was not repairable, why should webuy a satellite that's not?" During theworkshop, participants reported on in-orbit servicing and refueling projectsconducted by private industry, the U.S. Naval Research Laboratory, the U.S.Defense Advanced Research Projects Agency (DARPA) and NASA Goddard. Speakersalso cited projects under way in Germany and Canada. In February, the Germanspace agency DLR awarded a contract to OHB Technology of Bremen, Germany, toact as the prime contractor for the detailed design phase of the German OrbitalServicing Mission, a program that includes robotic technology to repair, refueland de-orbit satellites. 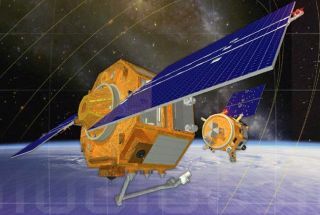 Canada'sMacDonald Dettwiler and Associates (MDA) Corp. ispreparing to launch a mission in approximately three years to deliver 2,000kilograms of fuel to an orbiting geostationary satellite. That work is beingdone for a customer that the company is not identifying. "We will validatethe whole idea of on-orbit servicing," said John Lymer,MDA chief robotics engineer. "We will show that it is not only useful tothe client, but that the service provider can make money as well." Inorder to see a profit, however, MDA must keep program costs as low as possibleby relying on existing flight technology, Lymer said. In fact, theonly way companies can make money servicingsatellites in orbit is to spread the cost of the missions and associatedtechnology across multiple jobs, said Glen Henshaw, aroboticist at the Naval Research Laboratory inWashington. "It's not a technology problem," he added. "We havethe technology to establish all of these capabilities today, but the technologycan help us close the business case." Henshaw compared thebusiness of satellite servicing with that of automobile servicing. Anautomobile's value and the way it is used helps to determine the types ofrepairs a customer is willing to make. Few companies would rebuild a Toyotaengine, but mechanics will perform that work to fix an extremely valuableautomobile such as a Maserati. Bycomparison, NASA is likely to pay a far higher price to repair and refuelbillion-dollar space telescopes than companies would be willing to pay to fixcommunications satellites, Henshaw said. Still, otherworkshop participants said that the sheer quantity and value of government andcommercial satellites in orbit indicate that there is an enormous market for in-orbitrepair and maintenance activities. To bringdown the cost of those missions and make them more profitable, companies aredeveloping a variety of technologies including advanced propulsion systems,improved fault detection programs, sophisticated sensors and equipment designedto ease the process of transferring cryogenic fuel, according to workshopparticipants. Anotherhurdle to clear before in-orbit servicing becomes routine is to convince seniorgovernment and industry officials that in-orbit servicing can be done safelyand effectively, said U.S. Air Force Lt. Col. Fred Kennedy. Kennedy was theprogram manager for DARPA's OrbitalExpress program, a successful 2007 demonstration of autonomous satelliterefueling and maintenance. "Thetechnology can help with that," Henshaw said. "We can beat down some of the perceived risk." However,some decision-makers will be skeptical until they see concrete demonstrationsof in-orbit satellite servicing. "We should just go do it," Henshaw said. "Until we do it, nobody is going tobelieve we can do it."